Leaping Bytes has announced the release of MapPocket v.2.3, an update to their map application that can help you to save a lot on roaming charges while traveling. MapPocket allows you to put online maps in your pocket, so you can use them later without an Internet connection. * Multi-zoom level recording is fully implemented. Now it is possible to save map tiles for up to 6 different zoom levels. Before you go offline, plan your expedition using an intuitive interface. At any moment touch one button to start recording what you see. MapPocket will remember all tiles you viewed. Once recorded, maps will be available any time without the internet connection. You can choose maps from one of four providers: Google, Mapquest, Bing or OpenStreetMap. If you go to Paris you may want to choose a "roadmap" view, if you go to the jungles of Amazonia you may prefer a "satellite" view. Recorded maps are easily shared between all your devices using iCloud or DropBox. 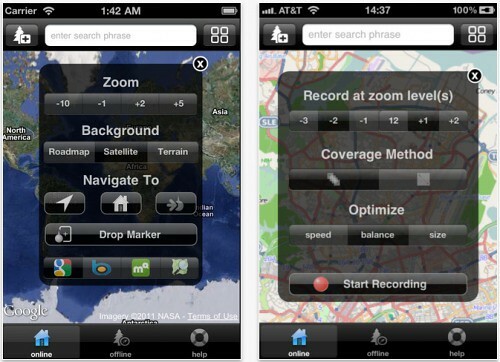 You can record a map using convenience of a large iPad's screen and later you can access the same map on your iPhone. While planning expedition (online), you can use standard search functionality to locate points of interest. Even when offline, you can use built-in GPS to pin-point your exact location on a recorded map. MapPocket 2.3 is only $0.99 USD (or equivalent amount in other currencies) and available worldwide exclusively through the App Store in the Travel category.